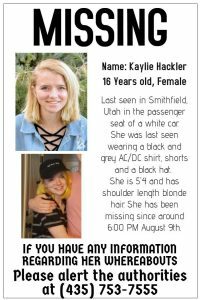 SMITHFIELD — The family of missing 16-year-old Cache County resident Kaylie Hackler is pleading for the teenager’s safe return after the girl reportedly left home and didn’t return Thursday evening. Kaylie Hackler was last seen around 5:30 p.m. on Aug. 9 in Smithfield, riding in the passenger seat of a white car, her mother Nylyn Hackler said Saturday. Kaylie Hackler is described as being 5-foot-4, weighing 110 pounds, with shoulder-length blonde hair. She was last seen wearing a black and grey AC/DC T-shirt, shorts and a black hat, according to a Facebook post by her mother. Kaylie is a student at Green Canyon High School in North Logan. Nylyn Hackler said her daughter did not take her medications with her when she left home, but the girl is believed to have her wallet with about $100 cash and a prepaid cell phone with her. Anyone with information on Kaylie Hackler’s whereabouts is asked to call the Cache County Sheriff’s Office at 435-753-7555. UPDATE: Kaylie was found safe a few days after she was reported missing. What state is this in?? Any update?? ?